I started posting Monday Muffins when I realized I was accumulating a pile of muffin recipes and I ought to get them posted with some sort of regularity. So on my old-fashioned paper calendar pages <gasp> I plotted out all the recipes I had in the can. So to speak. Some of these were easy to schedule. Pink Beet and Horseradish muffins? They go in February before Valentine's day. Butternut Squash and Ham muffins? They will go in the fall. Creamy Banana and Dark Chocolate Chip muffins? They can go up any time (and will appear in a month, if you're worried the link isn't yet live). I'd originally scheduled a batch of Nutella and Zucchini muffins to appear here today. They are the Matt Damon of muffins on the Jimmy Kimmel of this blog--they keep getting bumped! It's a great recipe, but I've decided that most other people don't have bags of shredded zucchini in their freezer in late winter, and teasing you with the enchiladas was enough, so I've permanently moved Nutella and Zucchini muffins to the summertime. You can see them here! Why did I bump those muffins? Because I could. not. wait. to share this recipe with you. It's delicious! I picked up a vat of dates at Costco during sled hockey practice, and after we enjoyed a bunch straight outta out of the container I started thinking about cooking with them. For my first attempt, I chopped up the dates, ate a few, chopped a bit more . . . and decided that they were so sweet I didn't need to use sugar. I added extra buttermilk, but it still wasn't quite right. I knew for the next batch I would process the dates in the small cup of my smaller and cheaper version of this Food Processor, but I was hoping to do another muffin without refined white or brown sugar. Then I hit on it--molasses! Sweet, but not too sweet. 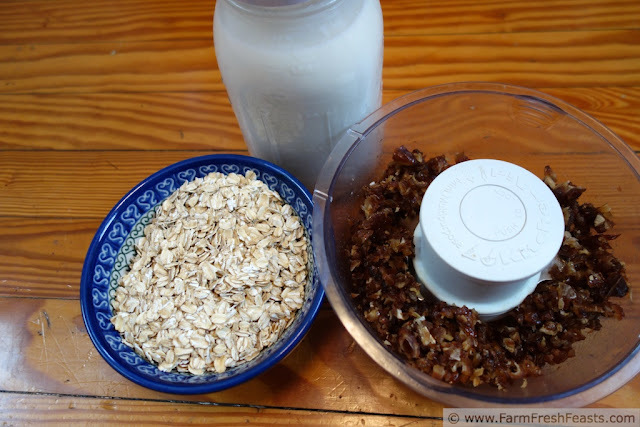 Adds a bit of iron, calcium, magnesium, and potassium to go with the whole oats and whole wheat. And the color pairs marvelously with the dates. Because I thought of this at suppertime, I was able to soak the oats, dates, and buttermilk overnight. 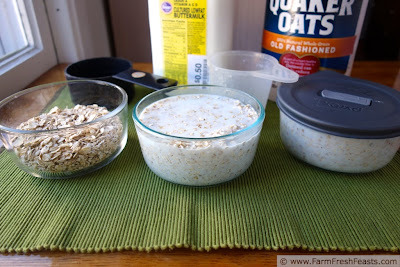 I like soaking oats overnight, but even an hour helps break down the whole oats into great-for-baking consistency. If you have fresh dates--eat some. When you get sick of them, or if you have a package of dried out dates in the back of the pantry--make these muffins! In a large bowl, combine oats and buttermilk. Add dates if they're dry, or you really really want to toss them in the bowl now. Stir to combine. Set aside at least an hour or up to overnight (see NOTE below). When you're ready to bake, preheat the oven to 400 degrees Fahrenheit and spray a regular 12 muffin tin with oil spray. Add the oil, molasses, and egg to the bowl and stir well. Dump the dry ingredients on top and stir until just combined. Scoop** into prepared pan. Bake for 15 to 18 minutes, until top springs back when you touch it gently. Cool 5 minutes in the pan, then flip onto a rack and cool completely. Enjoy! Matt Damon Nutella and Zucchini muffins, we're sorry we ran out of time! NOTE: If you like, prep the oats and buttermilk step a few days ahead of time and store in the fridge. This post is linked up with the Clever Chicks Blog Hop at The Chicken Chick and What's Cookin' Wednesday at Buns In My Oven, Taste and Tell Thursdays, What's In The Box at In Her Chucks, the Farm Girl Blog Fest at Let This Mind Be In You, and Strange But Good at Sprint 2 The Table. These muffins look full of sticky and sweet flavors with the molasses and dates - very yummy! They are really tasty--but safe for braces wearers, LOL! As usual you made another fine mess (err) great tasting muffin that I wish I could grab right from my laptop. Thanks! I'd like to wash it down with your Lemon/Orange/Limeade, so can we trade? Aiii these ones have my attention -- you are definitely the Monday Muffin Mamma! My mom said she came out here to "show me how to make muffins" but instead she seems to keep sitting and *eating* the muffins I make for her! I'm racking up the recipes, though. These sound great. Although, all day long I've had your orange cherry muffins on the brain and I can't wait to make them again. They were so good. Maybe this weekend. I can't stop thinking about them. Have you spoken with someone about this affliction? 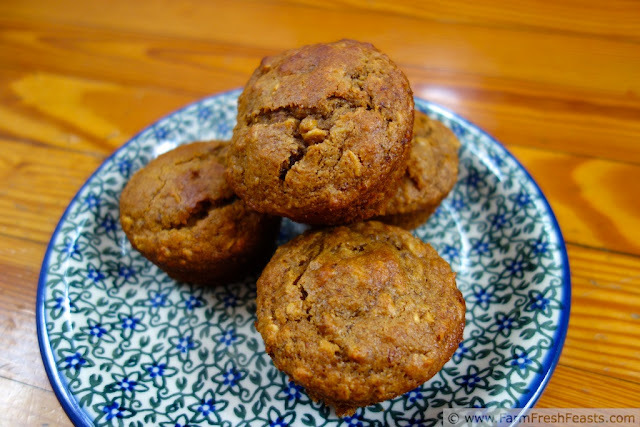 I've got some more muffins to tempt you with--yesterday I made banana/apple/cranberry/pecan/honey/yogurt muffins. Today it's blueberry, but I'm not quite sure what all will be in them. Though I've preheated the oven, so I need to think fast. I've just shared my affliction with the whole internet or at least those who read my blog. I am loving the sound of these banana/apple/cranberry/pecan/honey/yogurt muffins and can't wait to see them on your blog. these sound very tasty! Can you skip the soaking part if you are in a hurry, or is it completely necessary? But the original soaked oatmeal muffins called for only a 15 minute soak, so if you've only got 15 minutes extra you can do that. When I am in a hurry I don't use oatmeal, I prefer just flour in my muffins and go in a different direction. However, if you think about it in time, you can soak up to overnight (on the counter, if you want!) and bake the next day. Those look beautiful! I love the idea of using molasses instead of refined sugar - I'm going to have to remember that. I've been looking for a portable breakfast option for workdays and these muffins might just be it! I'm picturing your new business venture, Melissa's Molasses Muffins . . . you could have a cute logo and everything! These I have to try! Thanks so much for posting. I have a bunch of dates to use and this will take care of some of them! 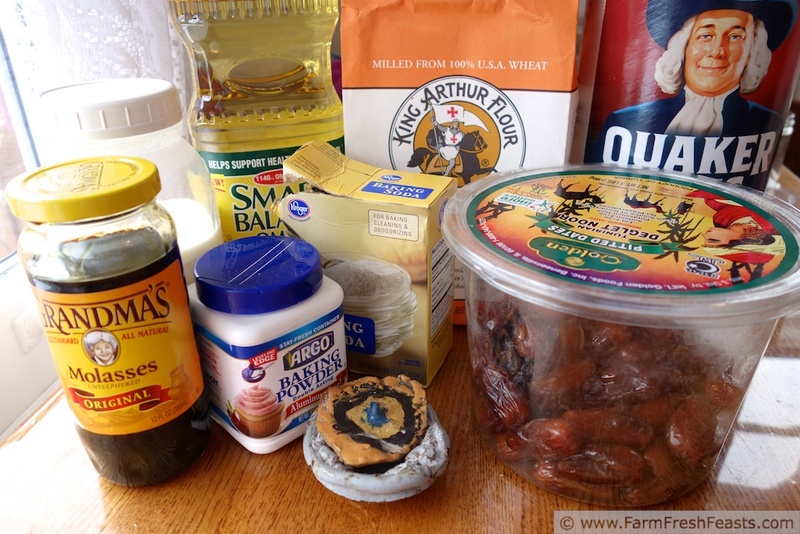 I love dates in anything, and so much the better if the recipe is healthy enough to count as a nutritious snack or breakfast! I always end up with a stash of something to use up, you know? And yes, I'm happy to feed this to the kids since I know what's in it and I know they'll like it. I feed my kids muffins for breakfast or after school snack, so I have to make a healthy muffin, or I feel guilty. That mom guilt thing. They really are tasty. My daughter just looked over my shoulder and said "can we have them", so I think I'm making them again. These look scrumptious and I just so happen to have a fresh bag of dates in my fridge...can't wait to see how they turn out. Thanks for sharing and as always...thanks for linking up! Heather, I'd be happy to switch fridge contents with you any time, mine is boring right now. Less than 7 weeks until the CSA season starts up! Just pulled these out of the oven! I'm excited to try them tomorrow for breakfast. I love how the recipe only uses 1/4 cup of oil and 1/4 cup of molasses for the sweetness. Very natural and healthy! I hope you liked them--I'm almost out of honey and keep forgetting to hit the farmer's market until Sunday evening, so I've been adding molasses to my bread lately. I made this recipe this week - instead of muffins, I turned it into a round cake. It was fabulous! I'm glad it came up on google search for "date oatmeal". You know my kids would be thinking that mom ranked higher if I baked their muffins in a pan and called it cake. That's a brilliant idea, and I'm totally running with it. Thanks for letting me know how it turned out--much appreciated!